Dont walk around with your head in the clouds at Halloween! 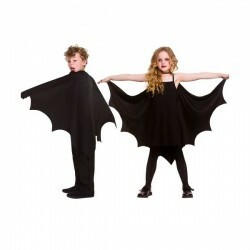 Improve your flying skills with our Halloween Costume Wings. Become a winged creature of darkness and take a night flight with the Fallen Angels, Devils and Demons, Vampire Bats and Vampiresses. Whatever your flying requirements our Halloween Wings will raise your outfit to new levels and lift your Halloween Fancy Dress Costume to new heights. So in truth our Wings may not be capable of giving you too much altitude and speed, but as a costume accessory they have certainly taken off, and at Halloween they just fly off our shelves!